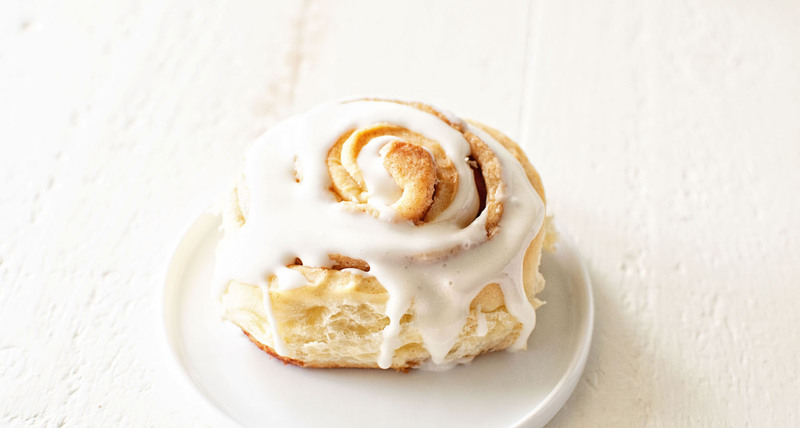 Snickerdoodle Cookie Dough Cinnamon Rolls: Rich brioche stuffed with snickerdoodle cookie dough truffles, sprinkled with cinnamon sugar, and rolled into cinnamon rolls. They will be here before you know it. I mean September seriously just flew by. Then Halloween. I’ve already done my part by eating all the Halloween candy we bought. I don’t even know if we get Trick or Treaters. We don’t have sidewalks or street lights where we live so I’m guessing no. I fear American Thanksgiving for so many people this year. I mean you have your usual Thanksgiving family drama that causes you to drink. But you usually hold your tongue while your drunk racist Uncle Carl rambles on and your mother sings her classic “I never see you” even though she sees you weekly. But besides the food, American Thanksgiving is known for football. This year of course we have an added level of Thanksgiving drama with our divided football kneel debate. Make sure to stock up on your booze ladies and gentleman and put away any breakables. If you have a family that tends to get into it then buy a couple sumo wrestler costumes and have at it in the backyard. Speaking of friends, I was missing my matron of honor Laurie yesterday something fierce. I’ve been on a huge bread making kick and I just seem to be making dough…to make dough. So yesterday I made brioche dough without really knowing what I was going to be doing with it. Then I thought of Laurie and our love of Snickerdoodles. How many years ago I made Snickerdoodle Cookie Dough Truffles in her honor. 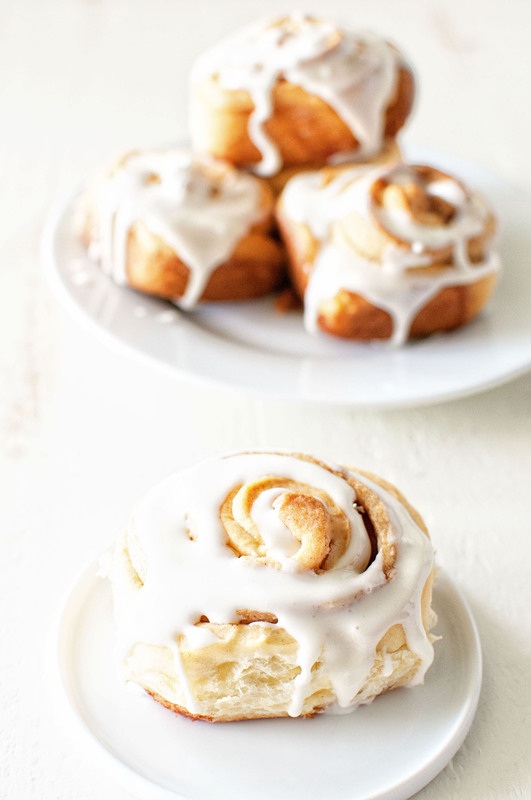 And with that Snickerdoodle Cookie Dough Cinnamon Rolls came about. The cookie dough does not have eggs because I have seen some bloggers try and use real cookie dough only to have it not cook through in the middle. And while I personally don’t think it’s a bad way to die…some others might not want to be poisoned. Wimps. These are amazing. The cookie dough on the top gets a little crunchy like a cookie but is soft in the middle. You really can’t go wrong shoving cookies into baked goods. Form a sponge by combining the yeast and milk in the bowl of standing mixer fitted with a paddle attachment and whisk until the yeast is dissolved. Stir in the sugar and flour, forming a thick batter. Cover with plastic film and let rest in a warm environment for 30-45 minutes. As fermentation begins, bubbles will form. Add the bread flour and salt to the sponge, then add the eggs. Mix on low speed for 2 minutes, or until the eggs are absorbed. Increase the speed to medium and knead the dough for 5 minutes. The dough will eventually begin to slap around and pull away from the sides of the bowl. Then it will form a ball on the paddle. Finally it will relax and reach back out to the sides of the bowl. At this point, it will be a shiny, satiny dough. While all of this is going on, don’t walk away. Watch the transformation and hold on to the mixer when necessary, since it may jump around. On medium speed, add the butter, 2 tablespoons at a time. Stop the mixer and scrape down the sides of the bowl occasionally. Knead until the dough is shiny and smooth, about 5 minutes. Scrape out the dough, wash and dry the bowl, and coat it lightly with oil. Place the dough in the oiled bowl and turn it so the top is coated with oil. Cover with plastic film and let rise at room temperature until doubled in volume, about 2 hours. After the dough has doubled in volume, press down to deflate, folding one half into the other. Fold two or three times, either in the bowl or on a lightly floured surface. Cover with plastic film and place in the refrigerator for at least 4 hours or overnight. (If you don’t have that much time, you can let the dough rise for the second time at room temperature. It will take 45-60 minutes.) This is the second rise. In a medium size bowl add the flour, spices, salt, and cream of tartar. Set aside. Using a stand mixer (or a bowl and beaters), cream together the butter and sugar until light and fluffy, about 3 minutes. With speed on low, slowly add flour mixture, alternating with condensed milk, beat well after each addition. Set aside covered at room temperature. Using a rolling pin, roll it into a rectangle approximately 12×18 inches. Spread the butter on top of the dough, leaving a 1-inch margin at the top edge. Sprinkle 1/2 the cinnamon sugar evenly on top of the butter. Remove half of the Snickerdoodle Cookie Dough Truffle from the bowl. Roll pieces into large balls and then flatten as flat as you can get the dough with your hands. Place flattened piece on top of the cinnamon sugar covered dough. You can spread it out more once on the dough by pressing down on it with your hands. Do this until the dough is completely covered except for the 1-inch margin. Sprinkle the remaining cinnamon sugar on top of the cookie dough layer. Grease a 9-x-13-inch baking pan with butter and sprinkle the 2 TBSP cinnamon sugar on top. Move the pan around to get the cinnamon sugar to coat all the butter. Set aside. Starting from the long side closest to you, roll up the dough like a jellyroll. Transfer the log to a baking sheet, cover withy plastic film, and freeze for 10 minutes. This will make cutting the buns clean and even. Using a bench scraper or chef’s knife, cut the log crosswise into 12 pieces, about 1 ½ inches thick. Place a bun cut side up 1 inch apart in the prepared pan. 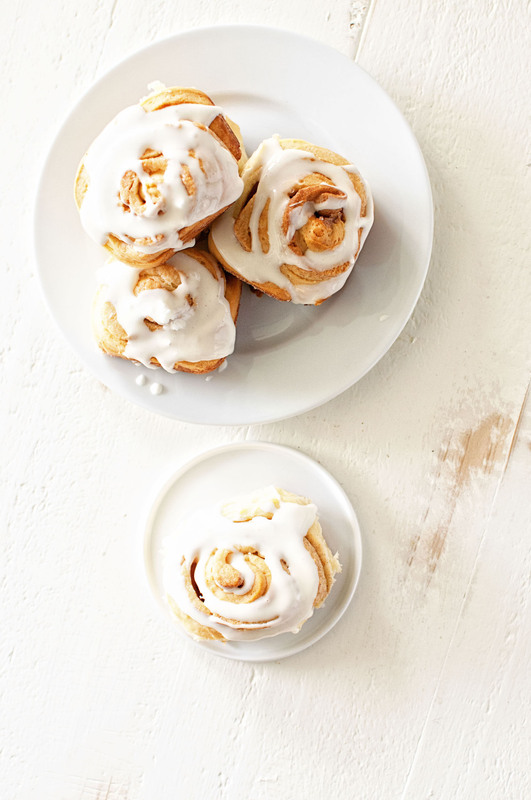 Cover the dough with plastic film and let rise for 1 ½-2 hours (10 to 20 minutes if the second rise was at room temperature), or until the buns have doubled in size. Toward the end of the proofing, preheat the oven to 400F. Adjust the rack to the center of the oven, with a baking sheet on the lower rack to catch drips. Turn down the oven temperature to 350F and bake for 15-20 minutes more. Remove from oven and frost. Combine powdered sugar, milk, butter, and vanilla extract. These are incredibly delicious, we all really want to make more of them right now :), since we finished the whole pan already. Yeah, they are very addictive. Glad you enjoyed them.